Pensato allows you to explore over 1400 musical scales and modes. 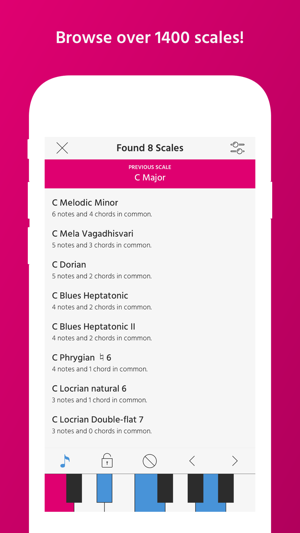 You can view the chords and notes of each scale for any root note. 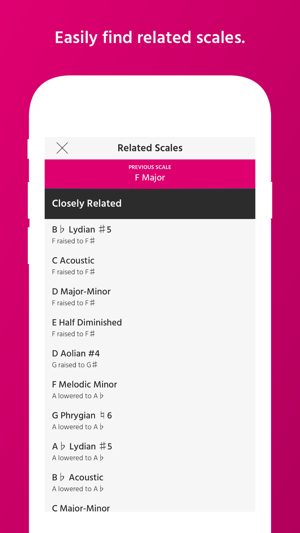 You can find scales by inputting notes on a piano keyboard, by picking from the circle of fifths or by choosing one of the auto-generated related scales. When you add multiple scales to your list you will be able to see what chords are shared between them. This is a great way to build up complex chord progressions and key modulations in your songs. You can use Pensato simply as a learning tool or to build up scale progressions while composing music. 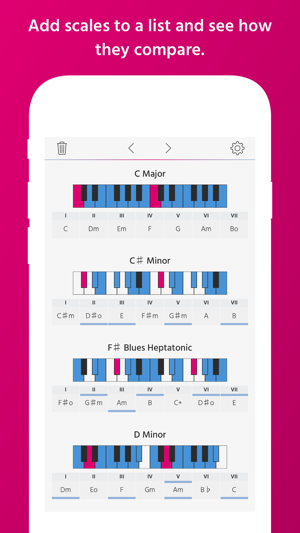 The main idea was to make an app that focused on scale progressions instead of chord progressions, allowing you to evolve your music with more richness and interest than if you were to stay in one key. Open up Pensato in front of you while composing music and easily visualize chords in various scales to help you write interesting progressions. • Library with over 1400 different scales and modes. • Includes standard 7-note scales as well as scales ranging from 3 to 12 tones. • Explore simple minor/major scales or more advanced blues, diminished, bebop and exotic scales. 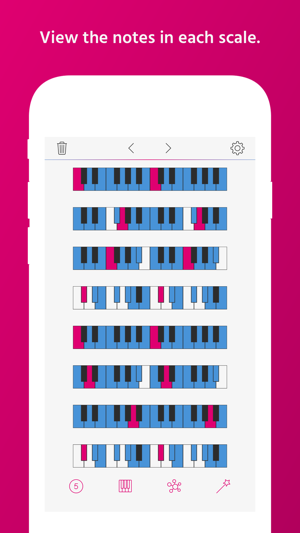 • A Smart-Finder allows you to plug in notes on a piano and find all the scales that contain those notes. This is a great way to find scales that match a melody. • A Smart-Suggestion page shows you all closely-related scales to the previous scale in your list. 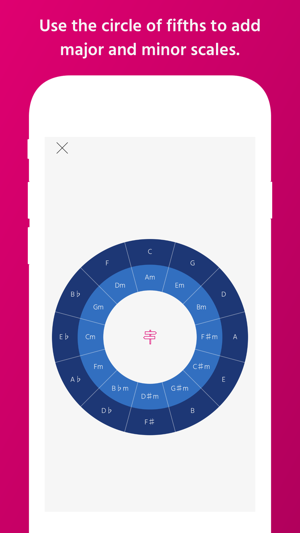 • Use the circle of fifths to easily add closely related scales. 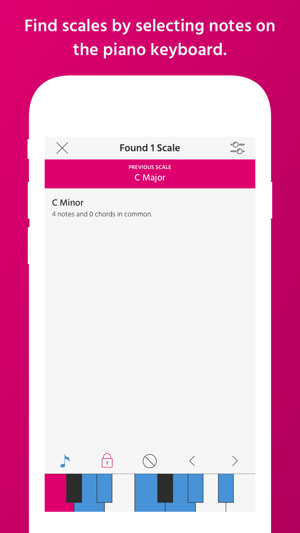 • See all chords contained in a given scale (either simple triads or full 4-note chords). • View the notes of the scale on a piano keyboard. Great for learning new scales or easily referencing familiar scales. 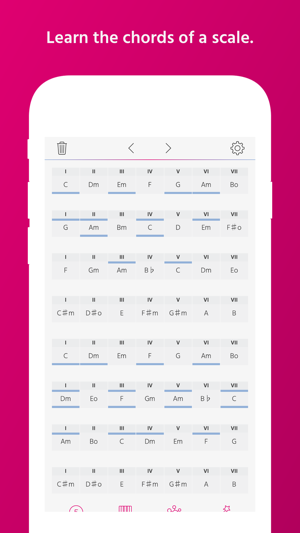 • Easily transpose all scales and notes. • Built in synthesizer lets you audition chords and scales. • Press and hold a chord to view its notes. • Add scales to your list so you can see what notes and chords they share. This is a great way to transition from scale to scale. • Your scale progression and settings are saved when you restart the app. 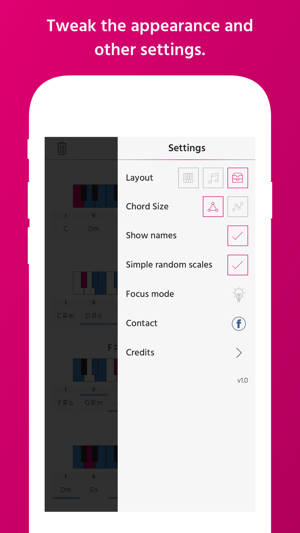 • Customizable UI allows you to hide the piano notes, scale names or chords. • A "focus" mode allows you to remove all the UI so you can focus on the chords and notes. • Ability to add a random scale to your list. Great for inspiration or for starting out a new song. • Beautiful modern minimal UI design. Focus on the content, not the interface. • Audition scales and chords by pressing and holding. Remember to turn on "Play sounds" in the settings. This has inspired me and made chords easier for me to understand and use in my own music. This app is very well thought out, and the most recent update has taken it a step further. I am an iPad user, and I use this app as part of my setup. Many of my virtual synthesizers are used in landscape mode, and the only other thing I can think of that would make this app even more useable in conjunction with my setup is if it also were able to be used in landscape on iPad. This is very nice for improvising and learning. Most of these scales don’t even come to mind when I sit to improvise. No more googling what pitches and chords are involved in a particular scale either. UI is good and clean, runs fine on iphone SE even with “limited” screen space. 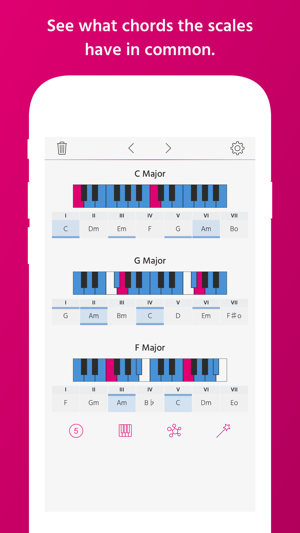 Showing which notes are in the chords would be pretty cool but is probably a huge modification to the app. Hey thanks for the positive words! I've released an update today (v1.1) which now includes the ability to show chord notes (simply press & hold a chord). You can now also hear what the chords sound like (enable "Play sounds" in settings). As a person who has primarily composed using sequencers this really helps bridge some of the theory I have been missing. It would be crazy useful to have a key guide for chords but just having the scales at a glance is incredible. Great app! Hey thanks for the feedback, glad you like the app. I've released an update today (v1.1) which now includes the ability to show chord notes (simply press & hold a chord). You can now also hear what the chords sound like (enable "Play sounds" in settings).